This is actually a Five Reads Friday x2. I've shared a lot of books based around different themes - holidays, toddler non-fiction, milestones, cover art, steals under <$10, etc. 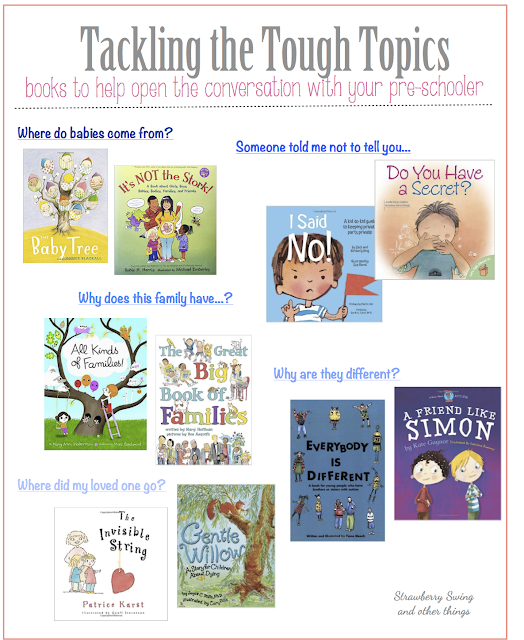 Since I'm in full fledged inquisitive pre-schooler mode, we will soon be having a lot of discussions that might be hard to have and I thought looking into finding ways to turn these discussions into teachable moments would be helpful for me and you, too! It can be easy to deflect the "where do babies come from?" with a short "From mommy's tummy", but eventually these curious minds are going to start asking more "How did I get out of your tummy? and How did I get in?". These little sponges are learning so much about the world around them, including topics that might be hard for us as adults to explain for the first time, like a beloved grandparent passing away or family friend being diagnosed with cancer. Finding books written for young children are a great way to open up these discussions, for little ones to learn about birth, social differences, disabilities, abuse, and death. These books will speak to children in their language and open up the conversation for them to ask more questions from you. Hopefully answering their questions honestly, but with enough tact or metaphor for them to understand and not be completely lost or traumatized. Hard Topic #1: Where do babies come from? The Baby Tree | It's Not the Stork! Hard Topic #2: Abuse. Discussing what is appropriate, private, and the power to speak up. I Said NO! | Do You Have a Secret? Hard Topic #3: Social, religious differences. Why does Jamie have two Mommy's? Why doesn't Sam celebrate Christmas? Why does Casey's look so different than her family? Hard Topic #4: Autism. Why does my classmate act differently? What is Autism? Hard Topic #5: Death. Where is Grandpa? What is cancer? Have you had to discuss any of these topics yet with your children? Did you use a book to start conversation and guide the topic in a gentle age appropriate way? Any recommendations, please share in the comments!